Paper back V G Cond. A collection of articles for both the novice and the experienced shooter to obtain the best results in their endevours. Spiral bound, V G Cond. 1939 Printing. 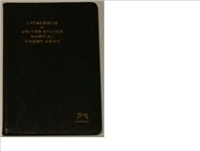 "This booklet is published to meet a demand indicated in letters to the publishers of UNITED STATES MARTIAL PISTOLS AND REVOLVERS, and lists only the U. S. Martial arms described in that volume. The prices entered herein are the result of compilation of average prices quoted in condition as stated, from ten lists of a number of reputable dealers, as issued in recent years (1936-1939) . Yankee Arms Maker. The Incredible Career of Samuel Colt. Rohan. Secondhand. some grubbiness to cloth cover. G Cond. Yankee Arms Maker. The Incredible Career of Samuel Colt. Book Ownership inside front cover. The Drama of the Scharnhorst. Busch. '"Scharnhorst" sunk by British naval forces 60 sea miles NW of North Cape, 26th December, 1943 at 19 hours 45'. So ran the radio announcement that told the world of the end of the German battleship "Scharnhorst". The implications of this short message, in terms of human experience, remained unknown until the end of the war when the story was told by the few German survivors and the officers and men of the British Navy. While the epic of the final battle forms the core of his narrative, Fritz-Otto Busch also depicts life aboard the 32,000-ton warship and records her short, eventful history from her launching in 1939 to her fateful demise. He relates how "Scharnhorst" sank the British aircraft carrier "Glorious" in 1940, menaced Allied shipping in the Atlantic throughout 1941, and made her impudent, flaunting dash up the channel to the safety of the Norwegian fjords in 1942. Considered by her crew to be a "lucky ship", her luck ran out in 1943 when she found herself outnumbered in Arctic waters by superior Allied naval forces. The British ships were equipped with Radar, the "Scharnhorst" was not - a fatal disadvantage that was to prove decisive. Colt Peacemaker. Collector Handbook and Guide. Cochran. Signed by the Author, Keith Cochran. 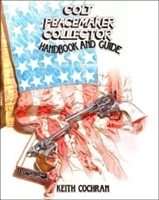 Contains all data on Peacemakers for collectors and information a collector will need to purchase a Peacemaker revolver. Text shows accurate identification and possible methods for cataloging collections and dealer inventories. This text is formatted in an encyclopedia manner with all parts of the Peacemaker covered in detail including factory variations and dates, models, engravers, and factory inspector marks. The author went on his first African trip in 1953 when he hunted in Tanganyika with PH Clary Palmer-Wilson. Bazzy was a lucky man and a good hunter, and on that trip he shot a lesser kudu that still ranks today in the top five in the record book. Once he acquired a taste of Africa, he wanted to go back, for, let's face it, who does not? In fact, he loved Africa so much he decided to make a living in the hunting industry. To that end, he started taking clients to Africa, and, at the same time he became an apprentice PH. He took numerous trips to East Africa in those early days, bagging most of the Big Five, before trying out the hunting fields of Sudan. His first safari to Sudan in 1961 started a love affair with that country that was to last most of his life. He went back to Sudan multiple times, seeing the country in all its savage beauty. There he met the greats of the hunting industry including Tony Sanchez, Angelo Dacey, and Franz Coupé. It can be fairly said that there are few people who have had more experience in Sudan than Chuck Bazzy. The Dark Continent is a large place, so, besides Sudan, Bazzy hunted in Botswana with PH John Kingsley-Heath when it just opened as well as in Kenya, Zimbabwe, Cameroon, and Ethiopia. In these and other countries he found many adventures and a few darn-good trophies (including a huge mountain nyala) and, of course, the many other things that Africa tends to provide the international hunter: lost or stolen luggage, problems with flights and connections, dysfunctional governments, rebels, bandits, poachers, and more. Much is said and written of the golden era of safari hunting, and one can argue when it began and whether we are still in the period today. However, few can dispute the fact that Chuck Bazzy experienced some of the best big-game hunting Africa had to offer over the past five decades. We should all be so lucky! 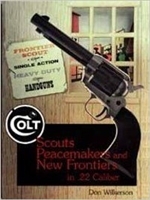 Colt: Scouts, Peacemakers and New Frontiers in 22 Calibre. Wilkerson. Here is the complete story, in reference form, of one of Colt's most innovative revolvers - the Frontier Scout and its subsequent variations. Over 570,000 single action .22 caliber revolvers were produced from 1957 to 1986 as a companion to their famous Model P revolver. This book takes the reader on a guided tour of the 48 major variations. In addition, numerous sub-variations are identified and discussed in detail. Many of these variations are quite rare and will challenge collectors. Complete production figures are presented for all models. Colt company records, coupled with a detailed survey, provide the basis for this in-depth study. Excellent black and white photography support and compliment the text. List of Changes in British War Material. Vol 1, 2. Skennerton. Secondhand, V G Cond, Mylar covered. Signed to original owner by Ian Skennerton. Vol 1 1860 - 1886. Contains the orginal text, woodcuts, and line drawings, the references to rifles, carbines, pistols, ammunition, ammunition pouches and bandoliers, swords, lances, bayonets, Dirks etc.introduced into British Service 1860-1886. Invaluable help to the Military researcher. 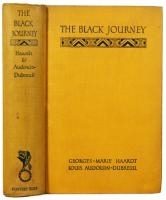 The Black Journey. Haardt, Auduin-Dubreil. Image shown is of American 1st Edn. English printing has blue cover which this copy is. 1st Edn Jan 1928. This is Second Printing April 1928. Hardcover. Book Condition: Good. No Jacket. Octavo, cloth. 316 pp. Illustrated in the text with reproductions of photos; pictorial endpapers. Journey across Africa in a Citroen. Age Spotting on edges and to some pages, bumped on spine edges, corner tear p 306. Original price inside front cover. 1.Second hand, As New, Mylar covered Signed by Author to Jim Bell Snr. 2. second hand label from previous owner. 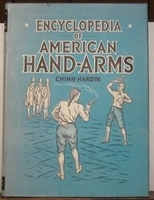 Encyclopedia of American Hand-Arms. Chinn - Hardin. Book signed by owner Charles E Stodter, noted Arms Instructor. Astra Automatic Pistols by Leonardo Antaris – and the subject is pretty self-explanatory. Antaris follow a simply and effective layout, with the book divided into chapters on each model of pistol (made very neat by Astra’s simple system of numbering different models). Each chapter includes a history of the pistol, production variations and tables, and photos of different variations, including prototypes, engraved examples, and accessories like holsters. Firearms Engraving as a Decorative Art. Harris. The decorative engraving of fine arms and armour is certainly one of man's more ancient arts. Since the time of Homer, and especially during the days of the Renaissance knight, weaponry has provided an important stage upon which to act out the decorative arts. In this important, indeed pioneering work, Dr. Harris has sought out the roots of the metal decorator's art as well as the actual on-the-bench techniques employed in bringing this art into the metal. Coupling the mind and methods of the trained medical research scientist with the special skills of the macro-photographer/photo-micrographer, Dr. Harris leads us visually, rationally and articulately through an artifactual history of the most vital period of American firearms engraving. The Browning Auto-5 Shotguns is the first book ever to cover the history, model variations, accessories and production dates of the legendary Browning Auto-5 shotgun. The authors; H.M. Shirley, Jr. and Anthony Vanderlinden combined their knowledge in specific areas to make this publication possible. 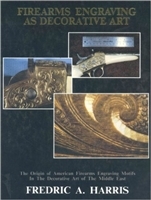 This publication is to date the only reference book on the Auto-5 (A-5) shotgun prepared entirely with the extensive cooperation and support of Browning, FN Herstal, the Ogden UT, Browning museum and the Liege Firearms museum. This reference is the only accurately researched book on the Auto-5 (A-5) shotgun and its production. The purpose of the book is not only to introduce the many models and details of the Auto-5 (A-5), but also to give the collector the first and only accurate method in dating a specific Auto-5 (A-5) shotgun. Just a bit of the information found in The Browning Auto-5 Shotguns: 1-The History of FN, (Fabrique Nationale) 2- John M. Browning and the Browning Arms Company. 3- The Creation of the Auto-5: From patent dates and numbers to prototypes. 4- The initial order of 10,000: A detailed analysis of the first order that John Moses Browning ordered with FN in 1903 and how many actually were shipped to the United States. 5- Serial Numbers: The first an only available accurate published record of serial numbers for all Auto-5 guns in all gauges. 6- Proofmarks: A historical review of the Belgian proofing system, as well as a detailed account of each proofmark and explanation as found on Auto-5 (A-5) shotguns. 7- Component Parts: Each relative part of the Auto-5 (A-5) shotgun is reviewed and changes and introduction dates on the changes is explained. 8- Models: All models are clearly discussed with their variations and introduction dates. 9- Boxes, Cases and Hang tags. 10- Engraving patterns: From the early custom "One of a kind" Auto-5 shotguns to the later special grade Auto-5 (A-5) shotguns. Read about the most dangerous animal, getting downwind of your elephant, how to track a man-eater, how hippos navigate, when poisonous snakes attack, where to aim when an animal is charging you, and why zebras are bad-mannered. 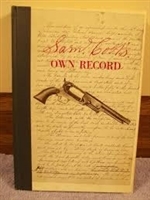 Samuel Colt's own record of transactions with Captain Walker and Eli Whitney, Jr. Chronologically presented, the correspondence published in this volume completes the account of the manufacture in 1847 of the Walker Model Colt Revolver. This book is a most unusual and rare look at firearms and early industrial history. This edition limited to just 1000 copies. 157 pages. Describes the various makes and models of German pistols during the Hitler era. Numerous b/w illustrations. 224 pages including contents and list of illustrations. The Lost Wilderness (Ltd). Ismail. The Lost Wilderness is the story of Mohamed Ismail's years in Kenya and Tanzania as a game warden and professional hunter. In this book Ismail chronicles the life experiences of five native Africans who worked with him during his years as a game warden as well as his own experiences as a professional hunter. Read about the most deadly poachers ever seen in the history of East Africa; the best ivory trackers; the most elusive quarry, the East African greater kudu; and Ismail’s dangerous hunts after buffalo and elephant. The pages are filled with the adventurous tales of brave men who always faced danger straight on--sometimes winning against considerable odds and sometimes losing, as was the case of the game warden who was killed by a poisoned arrow from a poacher! Come face to face with the other side of the law as you delve into the life of Tura, a notorious poacher whose limp was the result of a buffalo goring. These fascinating and engrossing true-to-life adventures of East African hunting hark back to a time that is now forever gone. Foreword by Patrick Hemingway, the son of Ernest Hemingway. Lugers At Random is a great place to start. It describes the basic differences in models and types and shows side by side photographs to help clarify them. It has disassembled guns with individual part names and a brief section on Proof Marks (6 pages). Then it goes right into photographs of Luger pistols. The Accessories chapter of the book is thin compared to what is available for the Luger. Same with the Proof Marks. Also there is no history of the Luger in the book. Of course that is not what this book is designed for, it is desigined to help be a reference to identify a gun, not learn it's history. Also the title sums it up pretty good, Lugers at random. There is not much order to this book at least not to a beginner. Once you have learned your Lugers, the ordering makes sense. Book is a publishers uncut version. 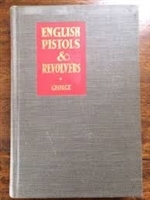 The book reviews the evolution of English pistols between the English Civil War (1642-49) and the late 1930s, thus covering the birth, flowering and death of specifically English inventiveness in this field. The author constantly sets technical development in social context, filling the book as much with good tales, as with spanning-keys, scears and springs. US and UK readers alike will enjoy the revolver-controversy of the 1850s between the American Colt and the English Adams. Sadly, this mature and definitive book was written by a still young man who was, soon afterwards, killed by a sniper while serving as an officer in World War II. Fine Colts of the Dr Joseph A Murphy Collection. Wilson. Signed By the Author, R. L. Wilson, Kathleen Hopy, Dr Joseph Murphy, Steven M Fliwa Phd. Lavish new work covers exquisite deluxe & rare Colt arms from Patersons & other percussion revolvers to the cartridge period & up through modern times. Colt Revolvers and Automatic Pistols sales catalogue of 1932. Colt Revolvers and Automatic Pistols sales catalogue of 1935. 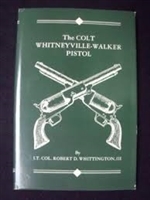 The Colt Whitneyville Walker Pistol. Whittington 3rd. The Colt Whitneyville-Walker Pistol, also known as the U.S. Model 1847, was the first repeating pistol purchased by the Army Ordnance Department for service use. It therefore received much attention from ordnance officers, who recorded and preserved historically significant details on the pistol, most of which are published for the first time herein. The Walker Pistol also firmly established Samuel Colt in the firearms business and initial use of the pistol by Texas Volunteers in the Mexican War created a legendary reputation for the Colt Revolver and firmly associated it with the Lone Star State. The author, Lieutenant Colonel Robert D. Whittington III, a native of Louisiana, a resident of Texas, and a retired United States Army Ordnance Officer, has long been associated with weapons of all categories, from flintlock to nuclear. He is also the author of "German Pistols and Holsters 1934/1945 (Vol. 1-4)". Over the past thirty years he has collected and studied Colt, Winchester, U.S. Martial, Smith & Wesson, Marlin, Ruger, and Browning firearms, in addition to World War II German pistols. A detailed study of the Colt Hand Arms -- From the 1868 Converted caplocks through to automatics. Huntington, WV: Standard Publications, Inc.. Very Good. No Dust Jacket 1945. First Edition. Hardcover. 233 pages, illustrations, red cloth, Gold Embossed, binding is tight, text is clean with no handwriting, signatures or highlighting. ; X X ; 233 pages . For years this was the standard reference work for the Smith and Wesson revolver aficionado, and it is easy to see why. This book contains a comprehensive treatment of Smith and Wesson revolvers from the founding of the company all the way through World War II. 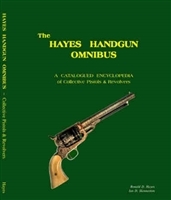 The book is divided into three distinct sections; the story of Smith and Wesson, illustrations of Smith and Wesson revolvers, and detailed descriptions of Smith and Wesson revolvers and their changes through the years. The story of Smith and Wesson spans over 130 pages and contains the complete history of the company and its developments up to WWII. The illustration section contains over 40 pages of photographs of various models of Smith and Wesson revolvers. The description section contains written details of every Smith and Wesson revolver developed through 1945, including notes about frames, barrels, bolts, hammers, etc. for each model. Whether you are an avid Smith and Wesson collector or just looking to learn more about one of America’s greatest manufacturing companies, this book will be a valuable addition to your library. 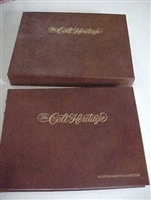 The Colt Heritage. Custom Ltd Edn. Wilson. Leather cover, Gold Embossed, Leather Slipcase. The 36 Calibres of the Colt Single Action Army. Brown. Inscribed by the Author. David M Brown to son of Pat Garrett, Jarvis P Garrett. Garrett Papers included. Some grubbing to front cover. 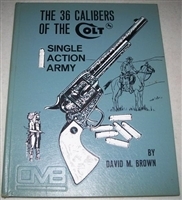 "More than twenty years ago David Brown began wondering how many calibres Colt's had used in the Colt Single Action. Many were ready and eager to tell him. Many 'complete' lists of calibres had been published. But the answers were different. . . The collection is, to the best of my knowledge and belief, unique and impossible of duplication, since it contains every calibre Single Action known to have been made by Colt's during the original (prior to 1940) period of manufacture, including nine calibres of which only one was ever made."